The Hotel Commodore, circa 1919. Library of Congress. My friends of the Guides Association of New York City, of which I’m a proud member, tipped me off to the news today that the Grand Hyatt Hotel is going to be razed. This is sad because 2019 is the centennial of the hotel’s opening. I was immediately reminded of the hotel because it’s an entry in my 2005 book A Journey into Dorothy Parker’s New York (Roaring Forties Press). I wrote a chapter about Mrs. Parker’s political side. By using her FBI records that I gathered with a Freedom of Information request, I leaned the many times that she attended events in the Commodore Hotel, its original name. It is too bad the old building is being demolished. But because Donald Trump scraped off anything historic of the hotel in 1979, it’s impossible to say if it could even be given landmark status today. But if you will read my entry for my first book, you’ll see there is plenty to remember the hotel for. Throughout the 1940s Dorothy was a popular guest speaker and host for political events and fundraisers, many of which were held at the Commodore Hotel, 125 East 42nd Street (at Lexington Avenue). Located smack in the middle of Manhattan and adjacent to Grand Central Station, the Commodore (renamed the Grand Hyatt in 1980) was for decades the most popular New York location for large-scale events. A sampling of Dorothy’s visits here demonstrates the range of her political involvements. In March 1939, she was one of several foreign correspondents and writers addressing a meeting of the Medical Bureau and the North American Committee to Aid Spanish Democracy, groups that were raising funds for refugees of the civil war. In December 1943 she attended a fundraiser for the Joint Anti-Fascist Refugee Committee honoring Lillian Hellman. In January 1945 she addressed a luncheon for the same committee, applauding attendees for aiding those suffering under Franco. And in March 1945 she chaired a luncheon at the Commodore honoring First Lady Eleanor Roosevelt, sponsored by the Southern Conference for Human Welfare, an interracial coalition of Southern progressives founded in 1938. Designed by architects Whitney Warren and Charles D. Wetmore, who also planned Grand Central Terminal, and completed in 1919, the Commodore was named after Cornelius “Commodore” Vanderbilt, who built Grand Central. It offered 1,956 guest rooms on 28 floors, making it one of the largest hotels in the city. The Commodore claimed to have the largest banquet and ballroom in North America—it could seat 3,500 for dinner—and hosted many of the nation’s most distinguished functions. Its large ballroom and proximity to the train station made it perfect for public events held by political groups. The Commodore has a rich history of famous visitors. Scott and Zelda Fitzgerald moved to the hotel during their honeymoon in April 1920, after being thrown out of the nearby Biltmore. When they arrived, they pushed themselves around the revolving doors for half an hour. President Franklin Roosevelt watched his election returns here, and it was here in 1948 that Richard Nixon, heading a subcommittee of the House Un-American Activities Committee, confronted accused spy Alger Hiss with his accuser, Whittaker Chambers. Senator John F. Kennedy began his New York State campaign for the presidency here in September 1960. 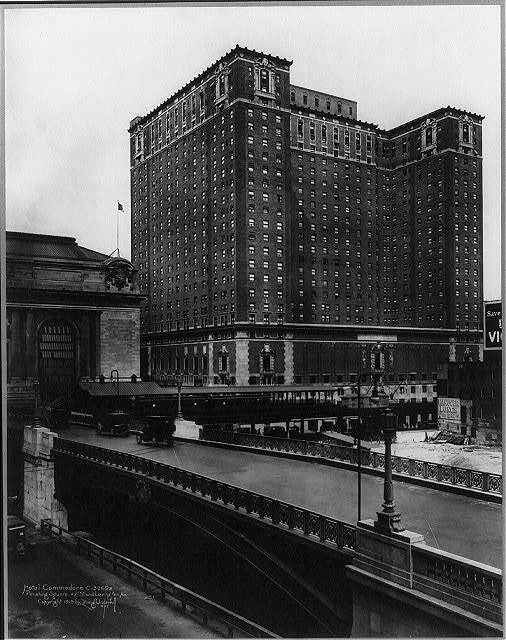 Before it was renovated, the hotel also had the grim distinction of being one of the most popular locations in the city for people to leap to their death. An early Donald Trump deal was the splashy transformation of the Commodore Hotel into a spectacular 1,400-room luxury hotel in the late 1970s. The old hotel was completely gutted, and a massive glass curtain was bolted to its exterior, sheathing it in a wall of glass. In 1980 it reopened as the New York Grand Hyatt Hotel. 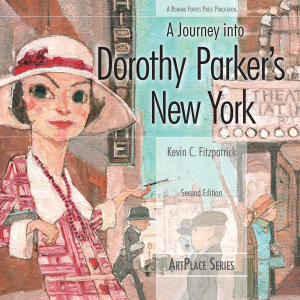 This entry was posted in Books, News and tagged A Journey into Dorothy Parker's New York, Books, Dorothy Parker, Research by Kevin Fitzpatrick. Bookmark the permalink.